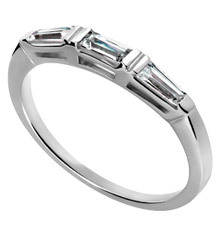 This is a 18k white gold 2 mm wedding band with three bar set baguette stones. The center stone is .14 carat and the two side stones are .09 carat each, all with a color of G-H and a clarity of VS. The total carat weight of the diamonds is .37 carats.